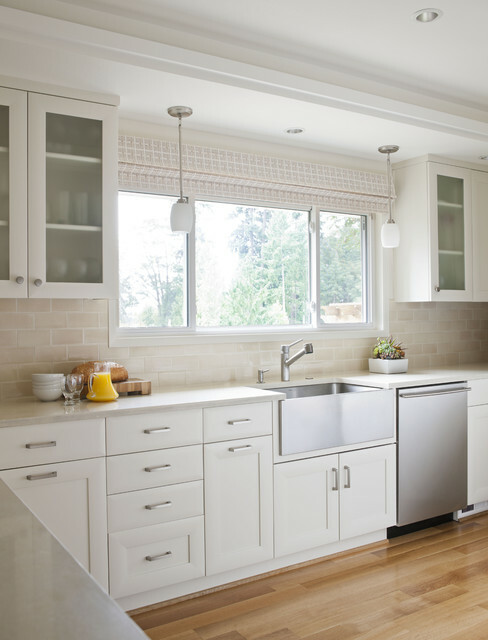 photo credit: John Granen Photography, Inc.
What is the backsplash tile? It is beautiful. the crackle finish tile is perfect for this kitchen. Nice. What color are the tiles matching the Tigris sand? What type of pendent lights are those? - I love the way the pendent lights in front of the window look and haven't found any quite like them. Do you know of any that are LED based? Thanks! We make Contemporary Stained Glass Lighting and Art and we have a similar lighting called the Galilee. We customize size and color; visit our website at http://www.lightinart.com/ to see some options. The windows were sourced by the contractor and the information is unfortunately not available to us at this time. What would you call the pattern on the Roman Shade? - I know that the homeowner purchased it separately, but can you tell me what you would call the fabric pattern on the shade? Is it a waffle-weave? Linen? Thank you for any direction you can give me. I am looking for a tile in this color, it is beautiful! Can you tell me what this is?? This is Encore Ceramics 3x8 Field Tile. It appears to be Beach Crackle, although it's hard to tell in this photo and it won't let me zoom in. You can find us on the Web at Encore Ceramics to find a Showroom near you. what type of sink is that? "The sink can be found through Blanco. It's a farmhouse, single bowl, undermount stainless steel sink." Who is the cabinet manufacturer? Where did you find the cabinet hardware and what's the style name? Tiles - What tiles did you use? Stunning kitchen! What type of flooring, color/stain, etc. is used? The flooring was installed to match existing. Tile - What is the tile called? Hi I really like this kitchen - I know you've had a lot of questions on it but could you tell me the ceiling height in this picture? Thanks. I'm not positive on the ceiling height, but I believe it is 8'-6"
Could you tell me the color of the cabinets? Beautiful work! It's a vendor specific color, "bisque"
Love this kitchen! Could you tell me the color of the countertops? - Thanks! What is the fabric on the roman shade? Love the sink... I'm worried about scratches on the front though...what has been your experience? The sink is a brushed stainless steel, so I would expect normal wear. We were just in the home last week and everything is still in great condition. Where I can find this sink please? The sink can be found through Blanco. It's a farmhouse, single bowl, undermount stainless steel sink. What kind of window treatment is that? - Is it a roman shade? What is the countertop material? Lighting - Take a look at our barn lights!